The muezzin lolls me out of a deep sleep with his plaintive call to prayer. It’s 5:30 in the morning, pitch black but for a swath of light through the curtains. Two-wheeled carts are rumbling along the cobblestone walkway below. A moped whizzes by. The repetition of verses, the imperative of the muezzin’s plea floats across the city in drawn out phrases. Chanting from the surrounding neighborhood mosques is out of sync, like a reverberating echo. It is mournful, but sweet, comforting, as if I am swaddled in a sheepskin rug. Ashhadu anna la ila ill Allah. I testify there is no God but Allah. Five times a day, Moslems are obligated to pray. It is one of the five pillars of Islam: Faith. Prayer. Charity. Fasting during the month of Ramadan. Pilgrimage to Mecca, called Hajj—at least once in your lifetime. Ashhadu anna Muhammadan rasul Allah. I testify that Mohammed is God’s Prophet. Hayya alas salah. Come to prayer. 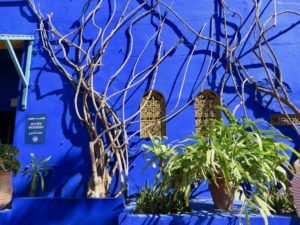 Omar shepherds us across four lanes of chaos to the Majorelle Garden, a placid oasis just steps from the harrowing traffic and diesel fumes. 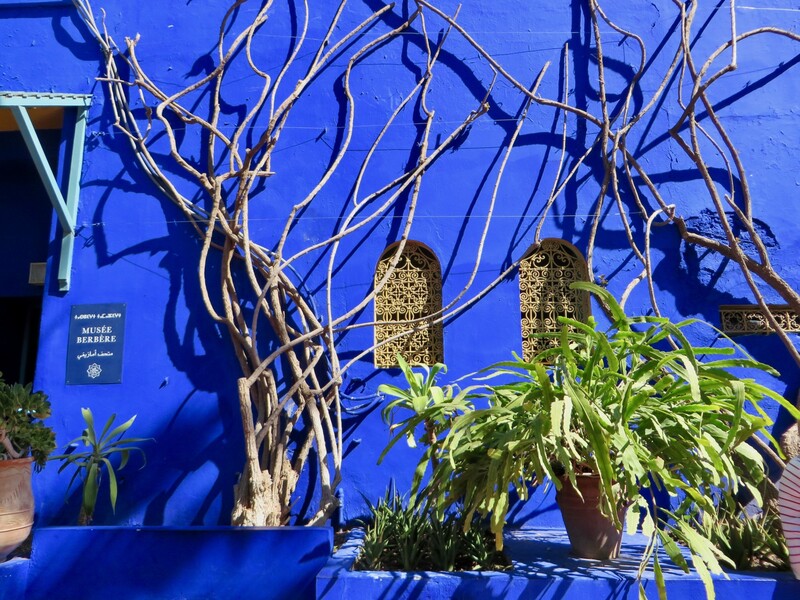 We pause among the palm trees and succulents, the mosaics and intensely blue walls. He answers our curious, perhaps intrusive questions. Does he pray every day? He’s a young, hip guy so we’re surprised by his answer. “Of course,” he says. He’s proud of a religion that asks this much of him. Then he adds, “There is no reason not to pray five times a day. It is only ten minutes.” He fasts during Ramadan, a month of refraining from food or drink between dawn and dusk. Sometimes Ramadan falls in the summer. Imagine the discipline required. Hayya alal falah. Come to security/salvation. In Morocco, ninety-nine percent of the population are Moslems, almost exclusively Sunni. They are moderate Moslems. Many of them drink, however surreptitiously. And gamble. Both are forbidden in the Koran. They fear extremists. They share a special bond with Jews, given a shared history of both having been expelled from Spain in 1492—at the time of the Inquisition. Live and let live seems to be their attitude. 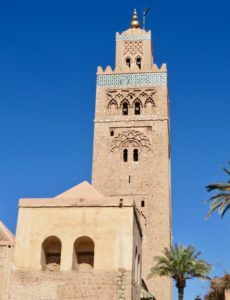 Contrary to what I’ve read and heard in the news about Moslems, I find the people of Morocco to be generous and kind, proud of their values. Not perfect, but an inspiration. La ilah ill Allah. There is no God but Allah. When I traveled in Bhutan, a Buddhist country that supports the monks and the mountaintop temples, I was comforted by a culture that values quiet contemplation. It reminds me of the ubiquitous public sculptures in Italy. What’s the effect on a people, on their psyche, seeing Michelangelo’s David or Brunelleschi’s Duomo on their morning commute? Back home, I wake up at odd times of the night, jet lagged, fighting the inevitable cold that comes from getting on a plane. I fantasize about the muezzin’s chant; I miss the rhythmic, mournful plea. I think, what about appropriating the emergency sirens in our town—erected to warn us in the event of an “incident” at our nuclear power plant? If the plant blows up, the only thing left to do would be to pray. But mostly what draws me to the call to prayer is that it’s a public prompt to stop what we’re doing, to hit the reset button on all the crap that diverts us from our better selves. I think of myself as a disciplined person. I eat my greens. I get exercise. I’m a writer. If nothing else, finishing a novel requires that I sit down, confront a blank page, write drivel, delete, and keep going. One word at a time. There have been times in my life when I meditated every day, without fail, but not now. I don’t mean it as an excuse, not meditating because of the individual effort it would take. But think about it: A public call to prayer. Five times a day. Endless opportunities to thank God. To be grateful. To plead for mercy and justice. For an end to the violence. For priorities that value life and freedom. And peace. I invite you to read related travel posts about New Zealand and Cuba. And my novel, Thin Places.